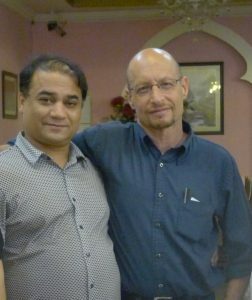 The January 15th arrest of Ilham Tohti, an Uyghur, a professor, and an activist for the rights of the Uyghur people inside the People’s Republic of China, is a distressing reminder of the realities of truly independent political thinking in China. The tragedy of a state that systematically silences people like Ilham on the basis of what are shaping up to be transparently trumped-up charges is obvious. But sometimes the human element is lost in the outrageousness of it all, particularly for those distant from the people and places in which such things occur. Ilham is a friend of mine. I consider it an honor to be able to state that. And out of that friendship I ask readers of this blog to remember that there is a dimension of pain in this sort of situation that goes beyond the political prisoner himself or herself and ripples out to the prisoner’s family and beyond. To that end I translate here a small number of tweets that reflect that very human reality. In America it’s already 2:00, early in the morning. But my head aches and I can’t sleep. I worry about my father, and I’m angry. Someone who tries to preserve the ties between nationalities, who stands up and speaks for his own nationality; such a person should be seen as a hero, and not thrown into prison! Justice? Where is justice? Ilham’s mother suffers from a number of ailments. Originally she was getting ready to be hospitalized for treatment. But because of Ilham’s arrest, yesterday she sadly returned to Xinjiang. Now Ilham’s wife is looking after their two sons, 4 [sic] and 7. Eight plainclothes police guard the door. Downstairs there are also many plainclothes police, to the point that they’ve taken up quarters in the neighborhood youth hostel’s private dining rooms; all for the surveillance of this one family’s mother and children. Ilham’s wife Guzelnur told me that the two boys have been crying for the last two days. Yesterday evening they were crying and wanting their father. They cried until 3:00 a.m. and finally fell asleep, exhausted. Today was the 9th day since Ilham was illegally detained. His 7-year-old son understands his father has been arrested. His 3-year-old son still doesn’t and often asks his mother where his papa has gone and when he’s coming back. His mother can only tell her little baby that papa has gone to care for their sickly grandma and will be back after two days. 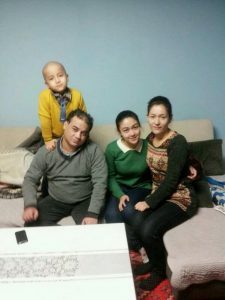 After Ilham’s mother returned to Xinjiang her health became even worse and she’s been bedridden ever since. This afternoon Ilham’s wife took her eldest son to get his hair cut. They walked past the bustling West Gate of Minzu University and her son said he felt dizzy. Ilham’s wife noticed that her son’s face was very red. It had been several days since he’d been outside. He and his younger brother had followed their grandmother out the gate. Following behind were plainclothes police. He was uneasy and so he shut himself up in the house, watching cartoons. But Ilham’s wife said her son’s eyes would suddenly tear up while watching the cartoons. Ilham’s wife said the four or five plainclothes police outside their door rotate often. These last two days they brought in a folding bed. Maybe they sleep outside the door at night. “Isn’t this too much?” she said. Yes, it is. It’s 13 days since Ilham was arrested. At home are only his wife, her mother, and his two sons, 3 and 7. Four people, woman and children, monitored by four or five strong young men: they’re too inhuman. When Ilham’s neighbors run into his wife, at the entranceway, in the corridors, or outside, they don’t say anything. In 2009, when Ilham “disappeared,” the neighbors also didn’t speak to his wife or children and pretended not to see them. This afternoon diplomats from the Canadian Embassy went to Ilham’s home to look in on his wife, mother-in-law and two sons. They wanted to bring some fruits, biscuits and toys as New Year’s gifts. But the four plainclothes police outside the door to Ilham’s home wouldn’t let them enter. The diplomats said “OK, we won’t go in. Why don’t you look inside the box, see what’s in it and then pass it on to Guzelnur, alright?” They still said it wasn’t alright. The diplomats had no choice but to leave. Ilham’s wife said her seven-year-old son can’t sleep and isn’t eating well. He’s become quite thin. Her three-year-old son thinks his father has gone to Xinjiang to care for his ailing grandmother. But he wants her to telephone papa and tell him to come back quickly. And he always wants his elder brother to join him in watching cartoons and playing games. Last night Ilham’s wife asked the older son, “Do you think papa is playing games like this?” The boy lowered his head and said “My heart is in pain.” He said it in Uyghur. A few days ago several diplomats from the American Embassy entered Ilham’s home without being obstructed, contrary to what one would have expected. Not only were they not obstructed, whereas normally there are four people at the door, there was only one. And he kept his distance. RT Hu Jia: Might diplomats from other countries go? Free Ilham Tohti! February 2: it’s exactly one year since I arrived in the U.S. and day 19 since my father’s arrest. This is a picture taken with Ilham and his wife Guzelnur, when I visited his home 7 days before he was arrested. Ok. I’ll let her know. @Uyghurspeaker@degewa Please let her know that she should be strong. At present more and more Uyghurs on WeChat and other social media are passing around news of Ilham. More and more people are coming to understand him. 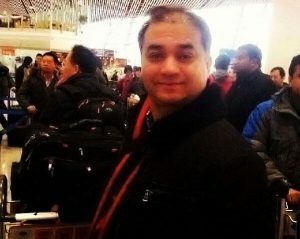 According to an investigation, Central Minzu University Teacher Ilham Tohti colluded with outside “East Turkestan” forces, used the internet to promote “Xinjiang Independence;” used the lecture hall to incite the “overthrow of the government,” used his position as a teacher to engage in separatist activities, put together a criminal gang of separatists with himself as ringleader and did serious harm to national security and social harmony. 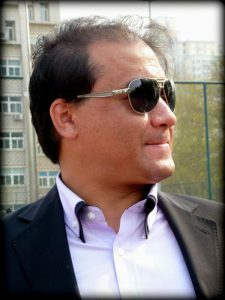 Ilham Tohti established and used the website “Uyghur Online” to organize, lure in, and manipulate a group to serve as website administrators, correspondents and informants, so as to stir up rumors, distortions, and hysteria about criminal cases; and to seize opportunities to manufacture incidents, spread separatist ideas, incite hatred between nationalities, promote “Xinjiang Independence,” and engage in separatist activities. Ilham Tohti used his position as a teacher to lure in, seduce, and coerce certain persons to form gangs to collude with an outside “East Turkestan” leadership to plot, organize and dispatch persons abroad to participate in separatist activities. With the Public Security Bureau’s meticulous investigation, there is conclusive evidence supporting suspicions of Ilham Tohti’s involvement in activities to split up the country. The case is presently moving through the next stage. As the internet control team asked for my views on the Xinjiang Issue and the Tibet Issue, I insisted on each nationality’s right to self-determination. An imperial determination for unification creates the root causes of enslavement to autocracy. I pointed out that the authorities’ arrest of Ilham was a particularly stupid application of power. It is pushing the Uyghur people to that level of hopelessness that will put them on the path of placing their lives on the line for the sake of resistance. Judging by the reaction of the police, should they one day charge me with “the crime of inciting the splitting up of the country” it would not be unexpected.